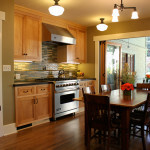 Harvest Architecture presented a 1916 Craftsman home in which to work our magic. 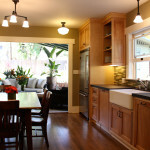 The homeowners desired a kitchen with Japanese influences which blurred the distinction between indoors and outdoors. 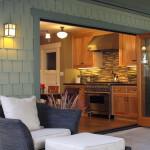 Harvest Architecture created a more functional design that incorporates a ten-foot-wide “La Cantina” bi-folding door that completely opens the space onto the patio. 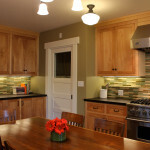 Other Eastern aspects include backsplash tiles imported from Japan, hardwood floors, and clear-finish birch cabinets.